PPHN stands for Persistent Pulmonary Hypertension of the Newborn, a life-threatening condition that develops soon after and infant is born. Pulmonary means related to the lung. Hypertension means high blood pressure. The pressure in the blood vessels to the lungs of a baby with PPHN is so high that bloodflow into the lungs is restricted and the amount of oxygen that gets into the bloodstream is limited. As a result, other organs in the body do not get enough oxygen to function properly. Newborns with PPHN have breathing problems soon after birth when their circulatory system does not make the normal transition from fetal to newborn circulation. This condition is known as persistent fetal circulation or PFC. Common symptoms of PPHN include rapid breathing and heart rate, respiratory distress signs such as flaring nostrils and grunting, and blue coloration of the skin. 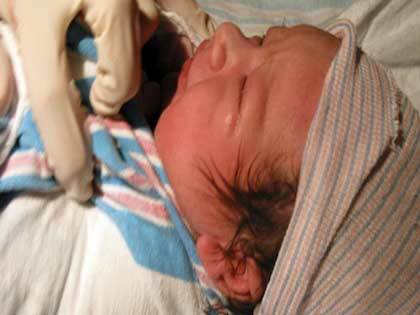 About 1 in 500-700 newborns in the U.S. develop PPHN. The Food and Drug Administration (FDA) warns that mothers who take Paxil or other SSRI antidepressant medications during pregnancy are six times more likely to have infants born with PPHN. The goal of PPHN treatment is reverse the pulmonary hypertension so the baby may regain normal blood oxygen levels. Treatments for PPHN are aimed at maximizing the amount of oxygen delivered to the baby’s lungs and, in turn, to the brain, kidneys, liver, and other organs. Advanced medical treatments have improved PPHN prognosis and survival rates. Today, persistent pulmonary hypertension of the newborn causes death in less than 20% of the infants diagnosed with the disorder. Of those infants who survive a PPHN diagnosis, only about 20% suffer long-term physical or developmental complications or permanent disability.